The rocket fuel running through Ohio sprinter Mike Shaw’s veins of has been on competitive ice for a while. 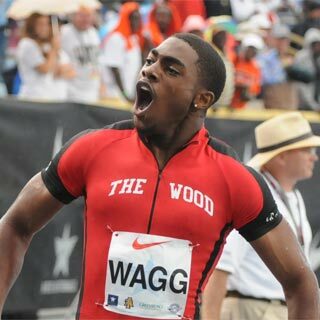 The talented Trotwood-Madison senior has been ineligible to compete for his high school’s track team since April due to a controversy regarding residency issues. The University of Michigan football signee’s family was investigated this spring by the Ohio High School Athletic Association (OHSAA) for falsifying Shaw’s residence after a January 2007 transfer from Dayton, Ohio's Archbishop Alter to Trotwood-Madison. As a result, and despite a last-minute legal appeal, he was restricted from competing in the Ohio state meet earlier this month. 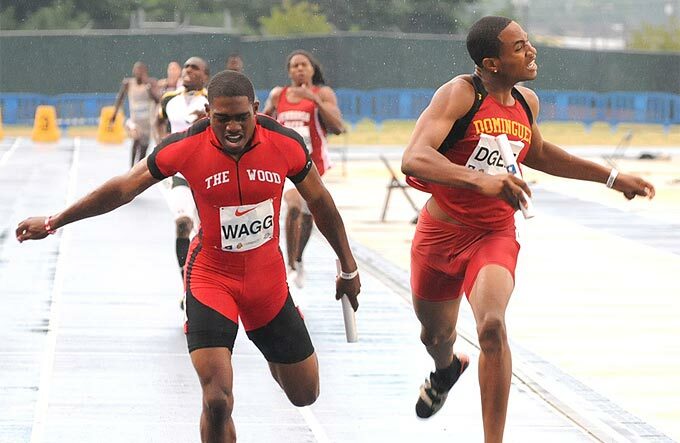 While that ruling was a major setback for one of the nation’s top speedsters, this past weekend at the 2008 Nike Outdoor Nationals, Shaw (left) finally had a chance to light that fallowed rocket fuel, competing for Trotwood-Madison’s post-season incarnation, Waggoner’s Raiders. Boy, did he ever burn bright. Any questions about Shaw’s fitness or his commitment to his team were banished on the first full day of competition, when he secured the first of three gold medals by anchoring the Raiders to a blazing US#2 1:25.18 victory in the 4x200. Runner-up was South Lakes VA, well back in 1:26.42. 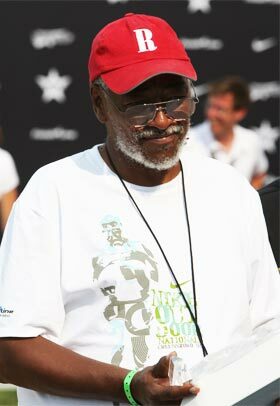 Randy Waggoner (right, photo by Vic Sailer), venerable assistant coach at Trotwood-Madison (and of his eponymous "Raiders"), was named the 2008 Nike Outdoor Nationals Coach of the Year in a ceremony before the start of the Saturday evening finals. He, for one, wasn’t worried about Shaw. On Saturday evening, Shaw proved the veracity of his coach’s assessment, returning to battle a 2.2 headwind and edge a closely-bunched 200 field in 21.19. In the near-blanket finish, Shaw’s surging chest thrust at the line was both the difference-maker in the furlong and a harbinger of his efforts less than an hour later in the climactic 4x400. It was the 4x400 title Waggoner’s Raiders really coveted. Not just because they were the defending national champions, having won the 2007 version of the event on a last gasp charge by Shaw in the final fifty meters. And not just because all of the pre-race hype seemed to center on US#1 Dominguez of Compton, California, with their flashy 3:09.59 mark from the California state meet. But also because it was Coach’s favorite event. First, Shaw and relaymates Derricus Purdy, Donte Lyons and sophomore Jordan Pascal would have to get past Dominguez and their not-so-secret weapon, 47-second 400 man Leon Dillihunt. 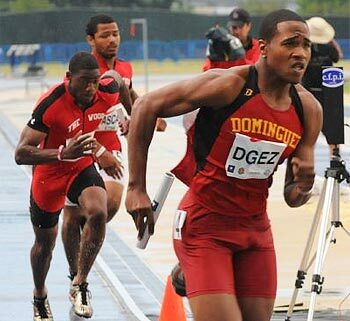 Despite his extended absence from the team, and the impressive numbers Dominguez had recorded on the track, Shaw didn’t feel like his Ohio squad was receiving the respect they deserved as the returning champs with almost everyone back (Pascal replaced ’07 leg William Henry). All the way into the final homestretch of the race, it appeared Dominguez had every intention of doing exactly that. Waggoner’s Raiders had the lead at the first exchange, with Dominguez pursuing hotly in second. Bethel VA, with 46.54 400m winner Ja-Vell “The Bullet” Bullard salivating in anticipation of his anchor leg, was trailing in the 3-4 position. When Pascal received the stick for the start of the pentultimate leg, Waggoner’s still had a strong lead, but that’s where Dominguez tried to shift the playing field by running their stud in the third slot. An eager Dillihunt snatched the baton for the Cali crew and took off after the Ohio team's greenest leg with abandon. Pascal held on until the final homestretch, at which point Dillihunt swung wide and walked the field with the sort of stretch run that leaves the grandstand whooping. The move left Shaw a few meters arrears of Dominguez's Aaron Hester (left) on the final leg, with Bullard of Bethel expected to be charging from behind. Powering through a wind-driven downpour that had been threatening for hours, Shaw narrowed the gap with a scintillating 46.4 closer, finally slipping ahead in the waning meters to eke out a 3:11.33 to 3:11.41 victory (below). Behind them, Bullard’s 46.6 anchor carried Bethel to third place in 3:14.00. Depleted but thrilled, Shaw bounced through the finish area woofing at his joyous teammates, then collapsed to the track and slapped the slick surface with in celebration. Coach Waggoner, with his weathered ballcap and white socks hiked to his calves, looked every bit the old school mentor as he shuffled onto the infield to congratulate his young charge. Although he's clearly been privy to many relay wars over the years, this one—like the young man who carried it home—seemed special. The veteran coach couldn’t help choking back tears as he considered his gutsy, reliable anchor sprawled on the infield turf. Like a lot of other Ohio runners through the years, they didn’t let Coach down.